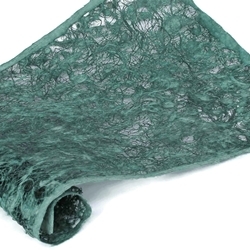 Hand-crafted dark green bark paper with an intricate lace design. Made from Amate, Nettle, and Mulberry trees, the unique and earthy tones of the trees perfectly blend together for an incredible crafting paper! The Tejido, or Lace Amate Paper utilizes bark fibers woven together in a heavy lace pattern with a solid pulp border. The differing bark textures, shapes and colors provide incredible depth and an intricate lace design while the dark green hues provide a natural touch for your project.